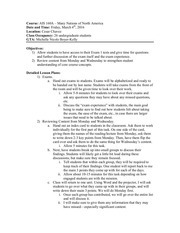 This PDF 1.4 document has been generated by Microsoft Word(Foxit Advanced PDF Editor) / Mac OS X 10.5.8 Quartz PDFContext, and has been sent on pdf-archive.com on 13/11/2012 at 07:01, from IP address 68.4.x.x. The current document download page has been viewed 801 times. File size: 278 KB (5 pages). Course Grades: See grading policies and other information below. will be averaged in at the end of the semester. Students: You are identified in the first column by your selected identification number. You can figure out your grade-point percentage by dividing your total individual points by the total number of course points. A = 90-100% B = 80-89% C = 70-79% D = 60-69%. 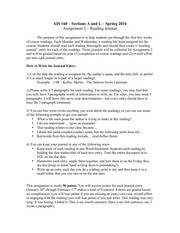 to the impromptu online essay for WA6, currently scheduled for October 31, 2012.
any time during the semester. See WA Draft Review in Bb for details. Make-Ups and Rewrites I do not accept make-up or rewritten work. 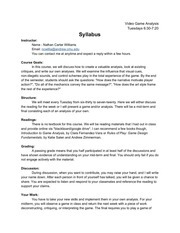 I want your best effort the very first time you complete an assignment. poorly on an assignment, learn from that experience, and use what you have learned to get a higher grade on the next assignment. Extra Credit I intend for a final grade in this course to represent the quality of work done for normally graded, required assignments. This file has been shared by a user of PDF Archive. Document ID: 00062401.